Here's a One Pound note of the (first) Fermoy Bank, Anderson, Anderson Bart, Staig. One of the less commonly encountered banks. Here is an ornately designed Fermoy Bank 1 Guinea note issued in 1811. This is an earlier type with John Anderson as sole partner. 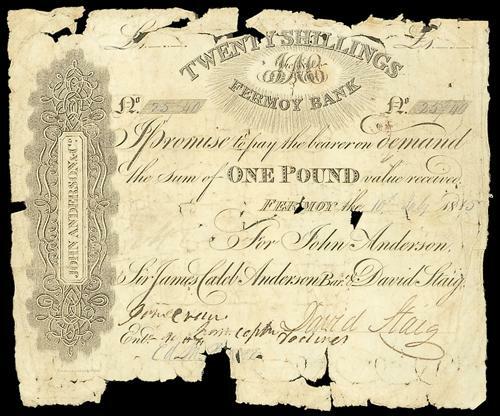 PMI indicates that John Anderson was from Scotland and the notes of the Bank were printed in Scotland. The design and shape of the note is reminiscent of Scottish notes of this time.